Watch “The Delian Mode” a documentary on the innovative electronic music pioneer Delia Derbyshire, who worked from 1960 to 1973 at the BBC Radiophonic Workshop. She utilized both real-life and ‘artificial’ electronic sounds in her compositions using a musical style known as Musique Concrète. Derbyshire’s Musique Concrète embodies the idea that concrete sounds from objects ‘found’ in the real world can be used like jig-saw pieces to construct an entire composition. Image by Draculasaurus. 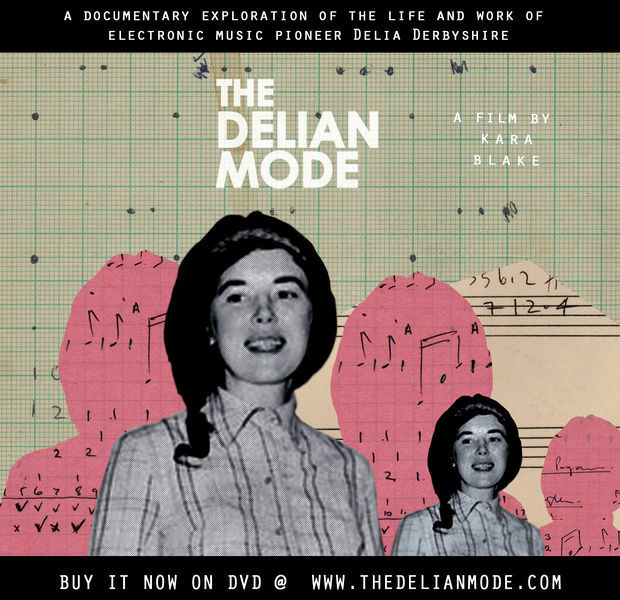 Canadian director Kara Blake‘s award-winning short documentary The Delian Mode is an audio-visual love letter to pioneering electronic composer Delia Derbyshire, best known for her spooky rendering of Ron Grainer’s Doctor Who theme music for the BBC Radiophonic Workshop in 1963. (Legend has it that when Grainer heard what she’d done—creating each quavering, alien-sounding note by speeding up or slowing down analog tape recordings of a single plucked string, then cutting and splicing it—with rulers, razor and cellophane tape—before embellishing the results with the sound of waveform oscillators and white noise, he asked “Did I write that?” She answered “Most of it.”). It’s an impressive piece of filmmaking, dreamlike, lyrical and especially pleasing to the eye—and ear—for a documentary. Blake wouldn’t have had a lot to work with (I’ve only ever seen one short film clip of Derbyshire) but does a wonderful job of presenting a well-rounded account of Delia Derbyshire’s work and of her influence on electronic dance music. Blake interviews Derbyshire’s colleagues at the BBC Radio Workshop, Adrian Utley of Portishead, Ann Shenton of Add N to (X) and Sonic Boom aka Peter Kember of Spacemen 3, Spectrum and E.A.R., who brought Derbyshire into his own work towards the end of her life on the E.A.R. albums Vibrations (2000) and Continuum (2001). The Delian Mode (Kara Blake, 2009) by anaimiaktion After Derbyshire’s death, 267 reel-to-reel tapes and a box of a thousand pages of music and notes were found in her attic.